In the Hierarchy view, click on the right-pointing arrow left of your GameObject to expand its content and see its Props and Anchors hierarchies. 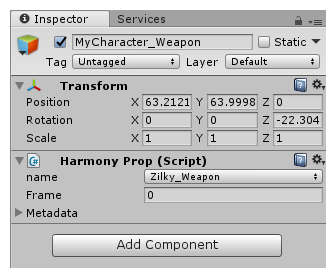 Expand both the Props and Anchors hierarchies to view your character's list of props and anchors. Select a prop, then drag and drop it over the anchor you want to attach it to. It should end up being a child of the anchor. 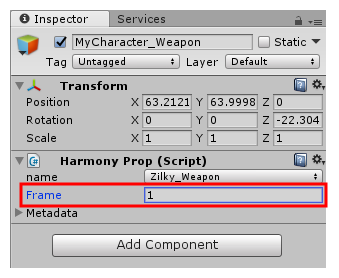 Select the prop in the Hierarchy view to view its properties in the Inspector view. Each prop has a Frame property. 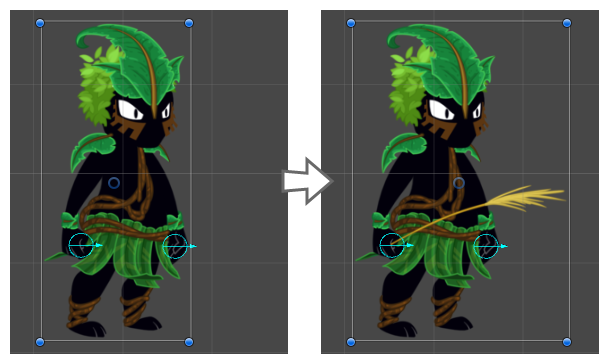 The prop has one frame for each drawing that was in the prop's drawing layer in Harmony. Its default value, 0, makes the prop invisible. Type in the index of the drawing you want to display in the prop object. For example, if your prop only had one drawing in Harmony, type 1 to display it. If your prop had 5 drawings, type a number between 1 and 5 to display one of those drawings in the prop object. 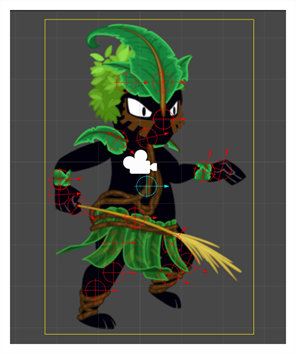 The selected prop frame will display in the Scene view, attached to its anchor.